Apple has gone and done it. 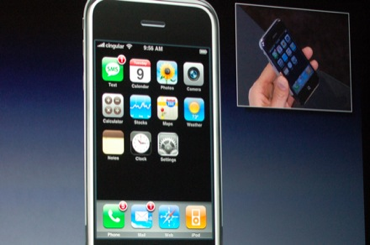 Steve Jobs just announced the iPhone. Has a 3.5 inch touch screen. Runs OS X. Is 11.6 mm thin. Has a 2 mpx camera. Totally cool and amazing UI. They are reinventing the phone. You can see your voice mails and listen to the ones you want with random access. 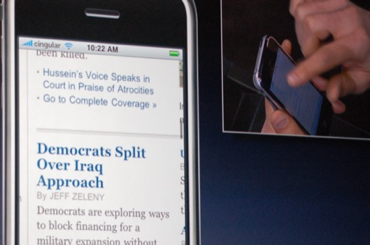 Double tap the New York Times webpage to zoom in. I'm an NYT fan, so this is going to be awesome! 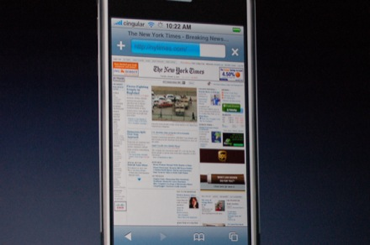 [photo cropped from Engadget's live MacWorld coverage of Steve's Keynote]. Too bad we'll have to wait some more. It ships in June. They are shooting for 10 million units sold in year one. Priced at $499 with a 2 year contract for the 4 gig model and $599 with 2 yrs for the 8 gig model. This is a case where I would for sure get the 8 gig version.